A loophole in the eligibility requirements to run for state office in Kansas has ushered in a young crop of candidates: four teenagers who filed candidacies in primaries for the state’s top two offices. "I felt there was a lack of youth engagement in politics and also there were many issues that were not being addressed by the Republican or Democratic Party and I felt I could change that," Jack Bergeson, a 17-year-old Democratic candidate for governor in the Sunflower state, told ABC News. "That’s why I got into the race." 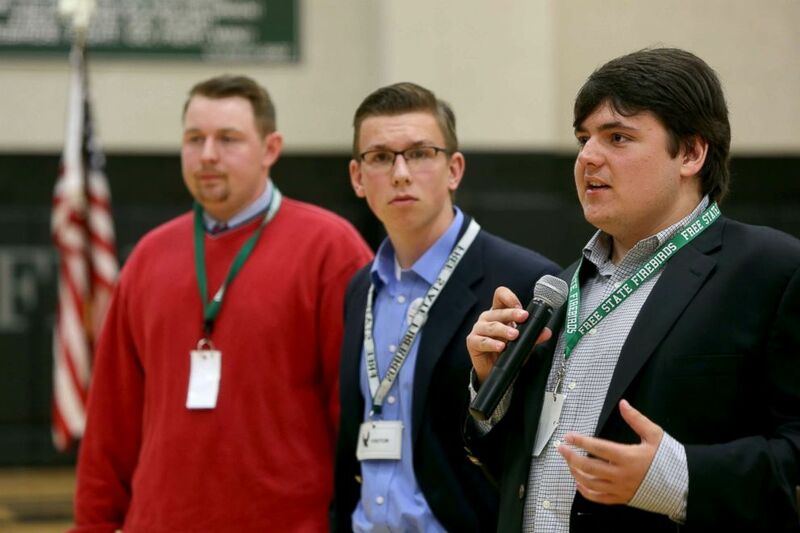 There are no minimum age restrictions to run for office in Kansas, and after exploiting this oversight, this group of high schoolers — including Republican candidates Joseph Tutera Jr., 17, and Tyler Ruzich, 17, who is on a ticket with Dominic Scavuzzo, 17, a candidate for lieutenant governor, plus Bergeson — will share the ballot in Tuesday's gubernatorial primaries with current and former state leaders. Jack Bergeson, 16, of Wichita, Kansas speaks during a forum with some of the four teenage candidates for Kansas Governor at Free State High School in Lawrence, Kansas, Oct. 19, 2017, joined by Ethan Randleas, 17, of Wichita. "Under Kansas law, there is no law governing the qualifications for governor, not one," Bryan Caskey, director of elections at the Kansas secretary of state’s office told the Kansas City Star. "So there’s seriously nothing on the books that lays out anything, no age, no residency, no experience. Nothing." As for their credentials for state chief executive? Ruzich, who is a senior at Shawnee Mission North high school in Johnson County and will be turning 18 in September, lists involvement in the debate team, school government and the Prairie Village's Teen Council among his experience. He is also the only public school student in the race. In an interview with ABC News, Ruzich stressed that it is his ideas to empower youth, and not his age, that is driving his candidacy. "We don't have a voice at the table when policies are being made," he said. "I can be a spokesperson for the idea that young people need to be involved." Echoing that sentiment is Tutera, who said, "I feel like even if I get zero votes today, my job will be accomplished because all I'm trying to do is show young people that if I can find haven in the GOP, they can too." Though they have no political experience and are not able to vote in the primaries, these young candidates view their age as an asset — putting them more in touch with the needs of a state that has struggled in recent years due to dramatic budget cuts under former Gov. Sam Brownback. Bergeson underscored the significance of his age as a selling point for his candidacy. "People are no longer interested in experienced politicians who have the traditional resume," he said. "People are looking for someone who can fight for them and I think I was the candidate that was out front with that in this race." Earlier this year, the Kansas state legislature passed a bill that will impose age requirements for candidates for statewide offices. The law, which was approved by the governor in May after passing both chambers, amends the current qualifications for candidacy to institute a provision for age: a candidate must be 25 or older to run for governor or lieutenant governor. But the change will not take effect until January 1, 2019, keeping the four teenagers in the race for the 2018 cycle. If elected, one of the teens could potentially be sitting in the governor’s mansion in 2019, but their chances to be the next top elected official in the state are slim. The governor's race boasts a wide-open and crowded field, after President Donald Trump selected Brownback to be Ambassador for International Religious Freedom. The top two contenders for the Republican primary are Lt. Gov. Jeff Colyer and Secretary of State Kris Kobach, a very close ally of Trump who secured the endorsement of the president Monday in Trump-signature fashion. As a benchmark race for Republicans, this primary is a battle between an establishment candidate and a Trump-like competitor. Despite garnering support from the White House, Kobach trailed Colyer in fundraising for most of the year, and only surpassed Colyer after hauling in more than $1.5 million from his running mate, Wink Hartman, according to the Associated Press. 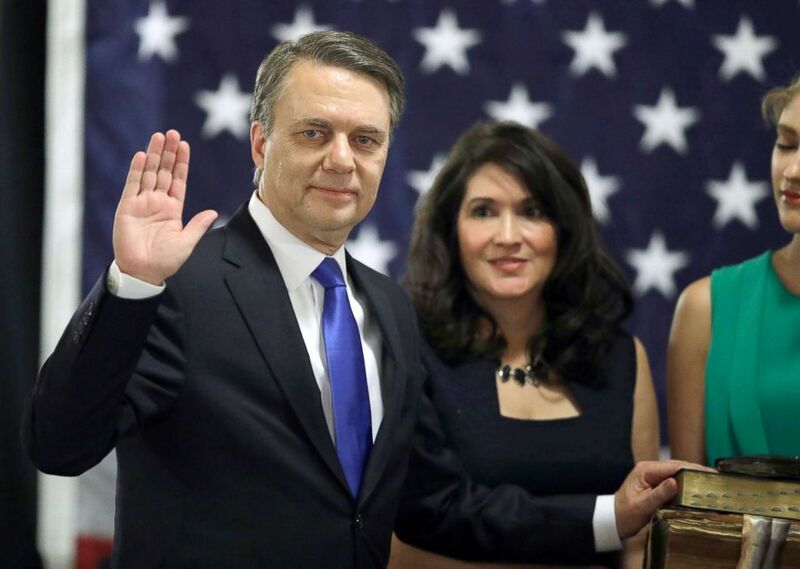 Jeff Colyer is sworn in as the 47th governor of Kansas during a ceremony at the Statehouse in Topeka, Kan., Jan. 31, 2018. In a state under Republican-control, the Democratic Party is holding a contested gubernatorial primary for the first time since 1998, according to FiveThirtyEight. With four possible frontrunners in former Wichita Mayor Carl Brewer, state Sen. Laura Kelly, former state Rep. Josh Svaty and House Minority Leader Jim Ward, voters will determine who secures the nomination. This might be a long-shot for these high schoolers, but after the shooting in Parkland, they see their bids as part of a youth movement that is seeing unprecedented momentum in recentering the country's moral core. It will ultimately be up to the voters Tuesday night to decide the fate of this new class of candidates. "We’ve done everything we can, we traveled the state, we’ve talked to voters, people have responded well to our message," Bergeson said. "I think we’re going to do quite well tomorrow. I’m expecting higher numbers than a lot of other people are expecting." No matter the outcome Tuesday, Ruzich and Bergeson made clear that winning is not the point of their candidacies. "I may not be the victor," Ruzich said. "But I can be the influencer … Never let anyone, regardless of your age, tell you your views don't matter." "We were able to shock the establishment and show that progressive candidates can do well in even states like Kansas," Bergeson said. "We can win without winning … A big part of my campaign, regardless of policy, I wanted to get young people engaged in politics and I view that we've already been successful."